This project I’m sharing with you today was inspired by my son. He always wants to help with dinner, and I try to let him help wherever he can with the prep work, but while I’m doing the cooking, he likes to help by setting the table. 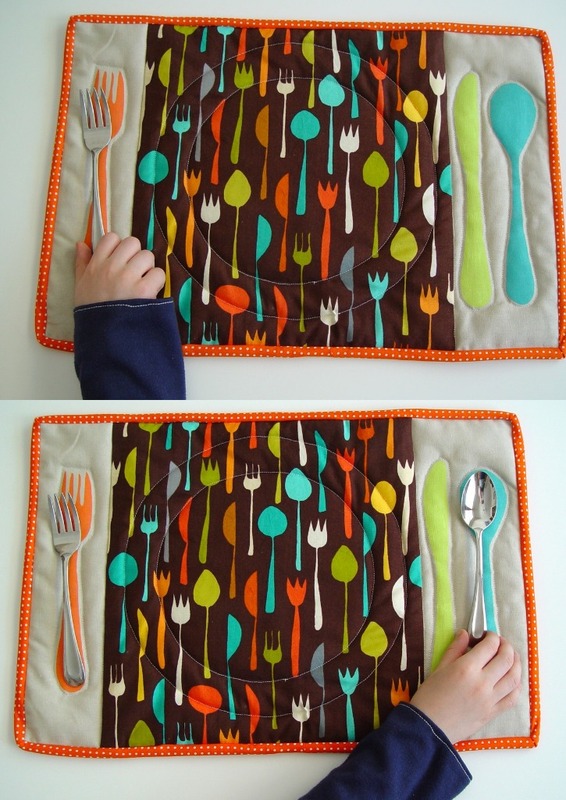 This placemat was designed to help little kids do just that, showing them where to put the plate, knife, fork and spoon. So I give you the . . . 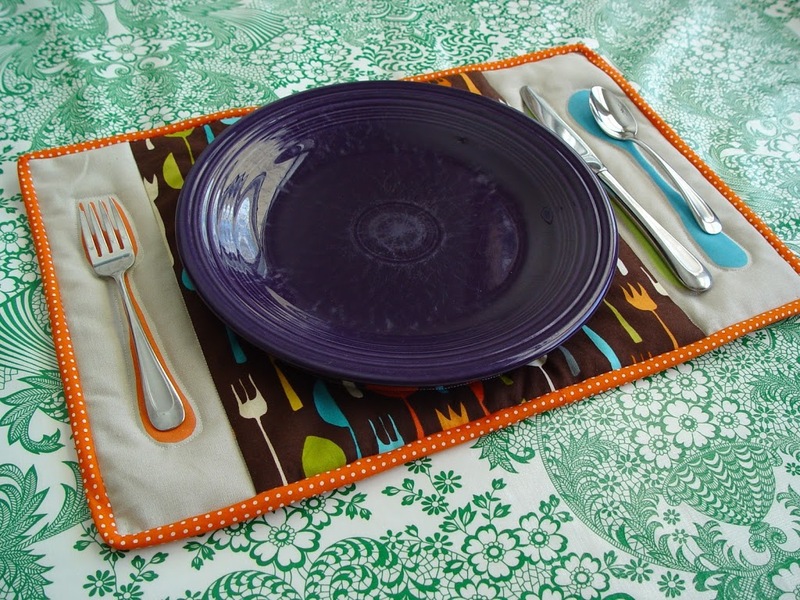 These Table Setting Placemats are fun and functional. 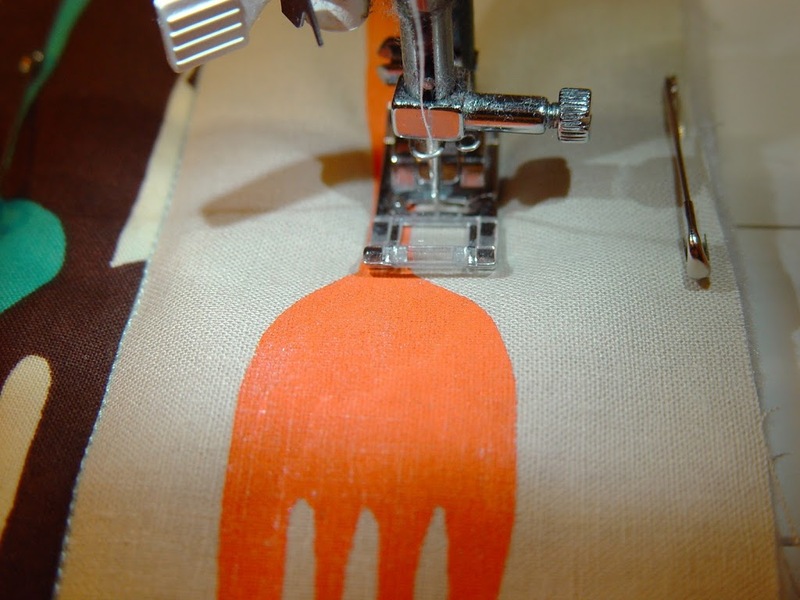 They bring together some of my favorite techniques: painting, sewing and quilting. 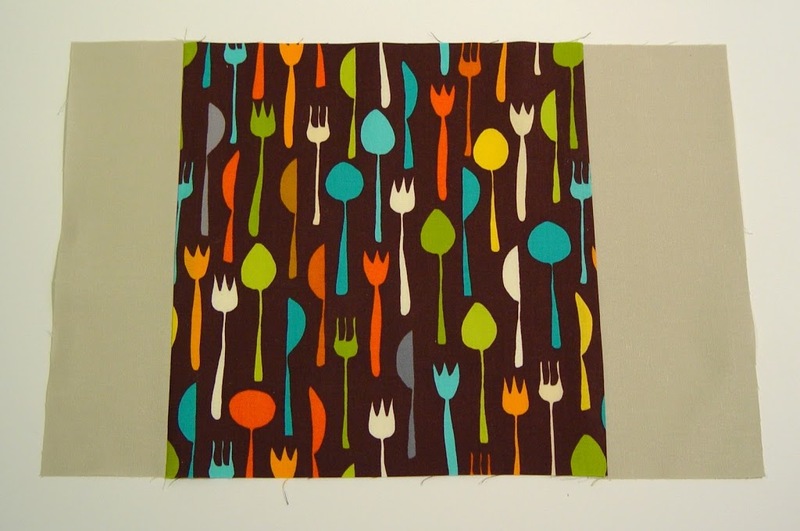 and the top of the placemat is pieced together to allow a fun fabric in the middle. 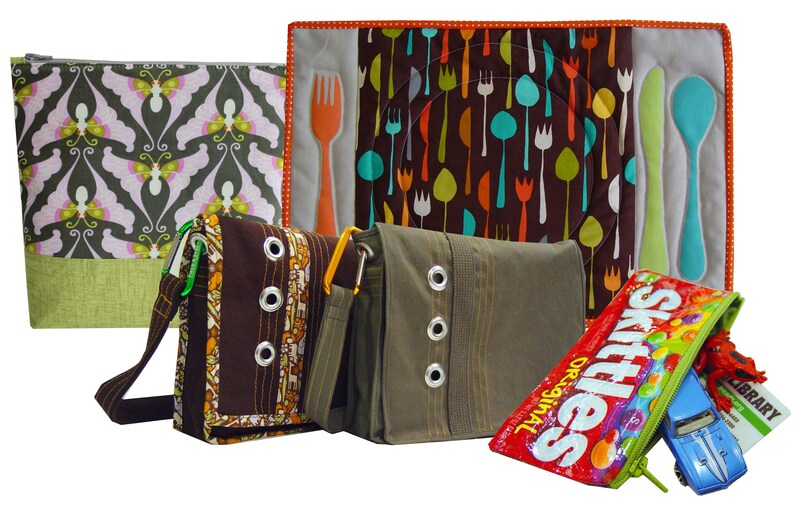 They can be bright and fun like mine or made to coordinate with your kitchen colors or patterns. 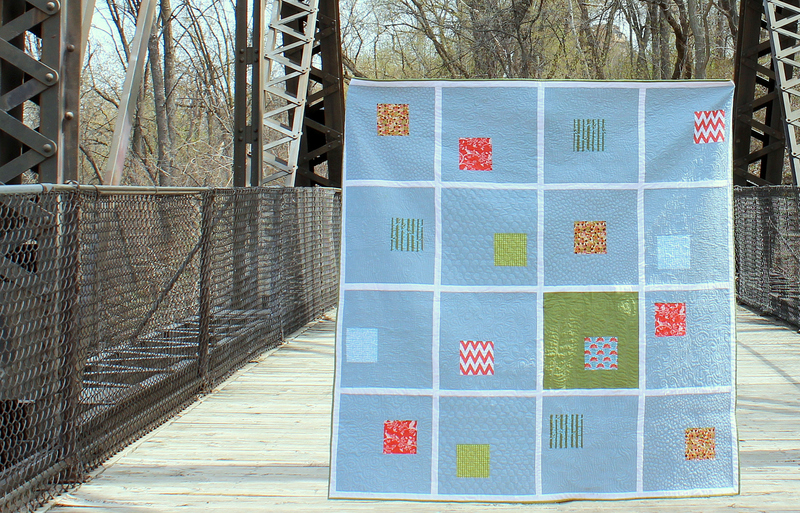 It has very simple quilting to make it a quick project. Then, of course, you must sit down for a little “snack” and some fun too. So let’s make this placemat! 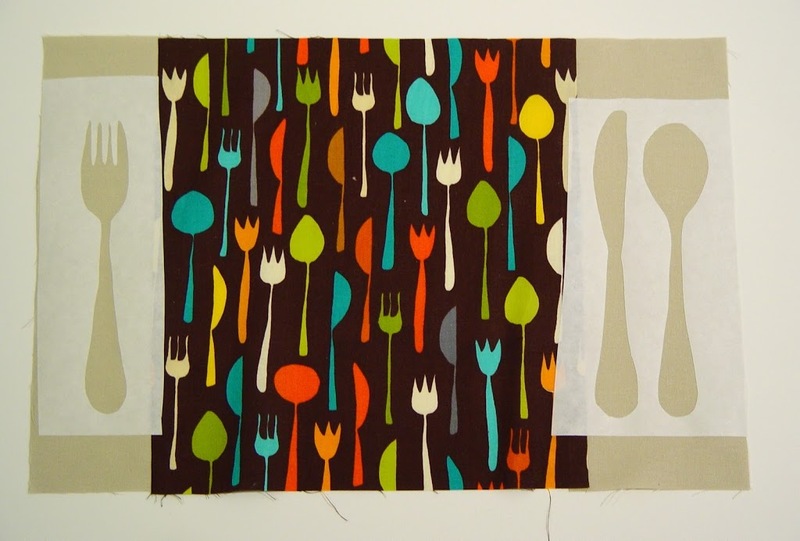 The fabric I used for the top pieces are Metro Cafe Flatware in Vintage (Robert Kaufman) and a linen/cotton blend in off-white. 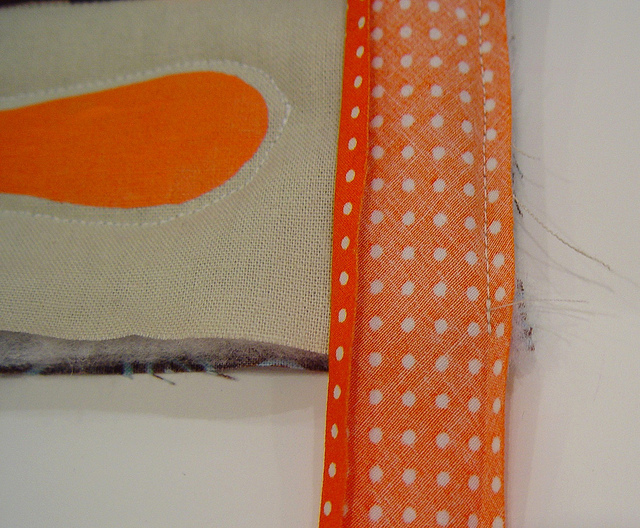 The binding is a small polka dot print from Robert Kaufman. The back is a print I had lying around from Jo-Ann’s. Seam allowances are 1/2″ for this project, unless otherwise noted. Start by sewing your middle front piece to the left front and the right front on the left and right sides, respectively. Iron flat and set aside. 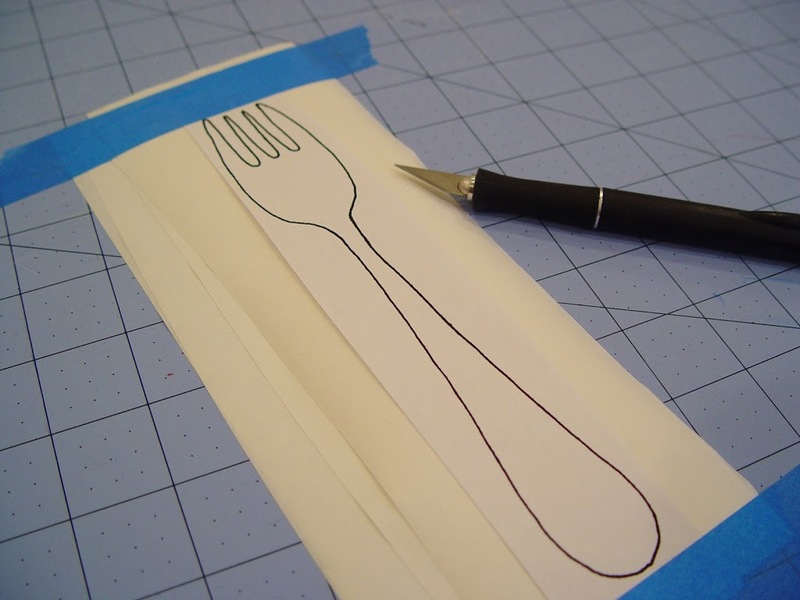 Using your template, cut out the knife fork and spoon onto freezer paper. Cut the fork on a separate piece from the spoon and knife. 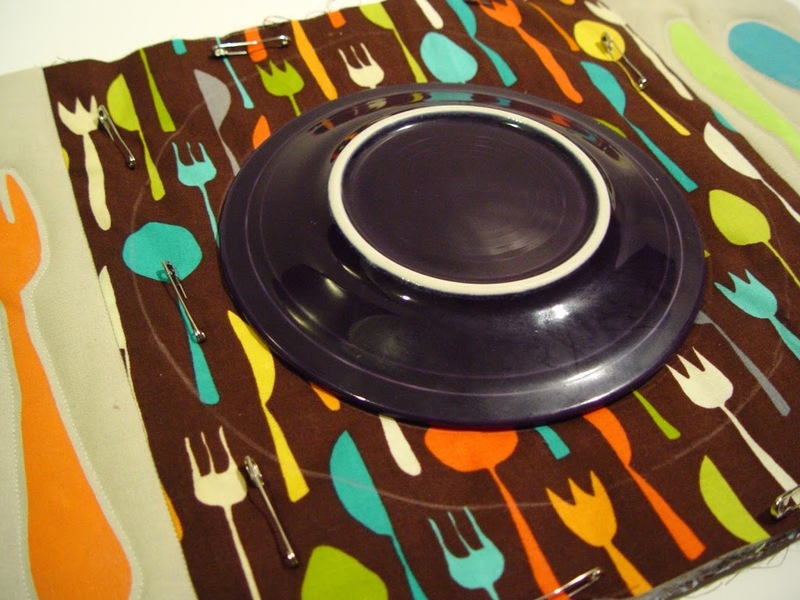 Hint: If you’re making more than one placemat, you can put a couple pieces of freezer paper under the template to cut out a few at a time. 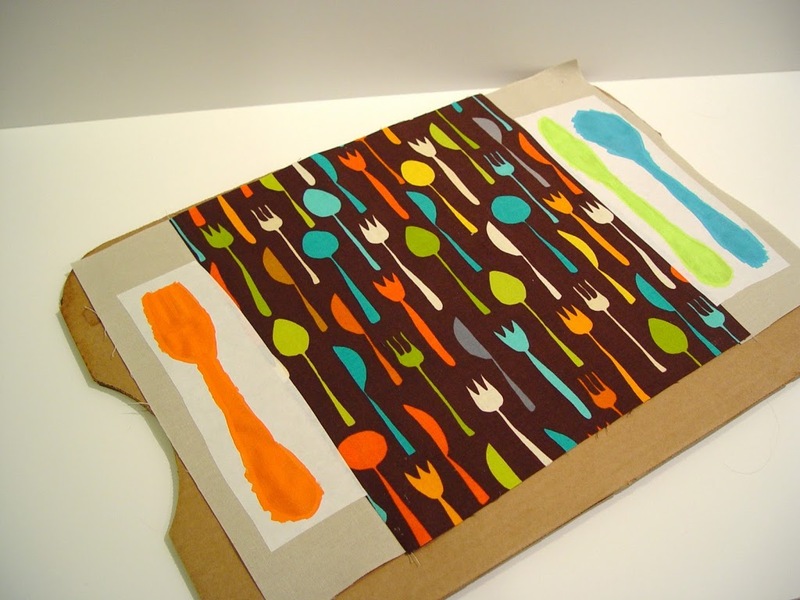 Paint the knife, fork and spoon using whatever colors you like. I chose colors that would compliment my center fabric. (Mandarin Orange, Lime and Turquoise). 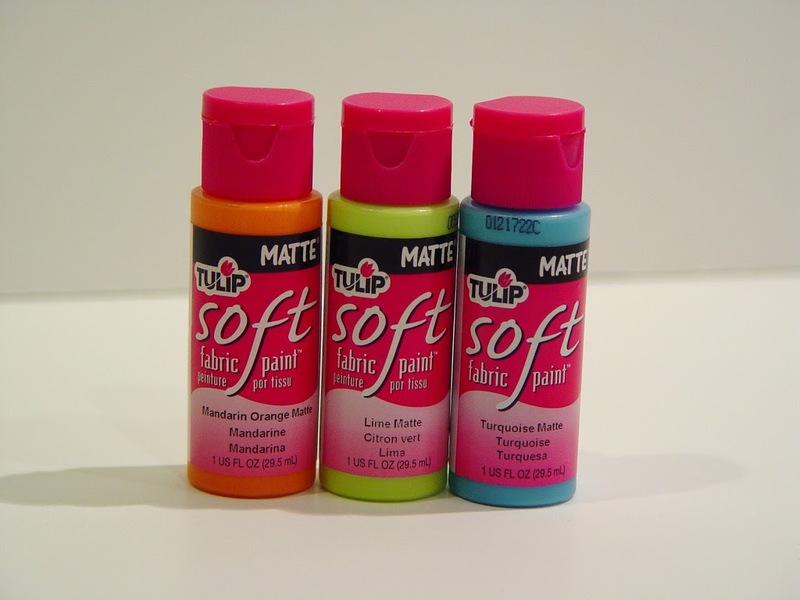 For some extra tips on freezer paper and painting go here. Allow the paint to dry before removing the freezer paper and when the paint is completely dry, heat set the paint by ironing it. You should feel a texture difference after heat treating (it will now be smooth instead of rough). Take your back fabric piece and lay it right side down. Next place the batting on top and finally your placemat top, right side up. 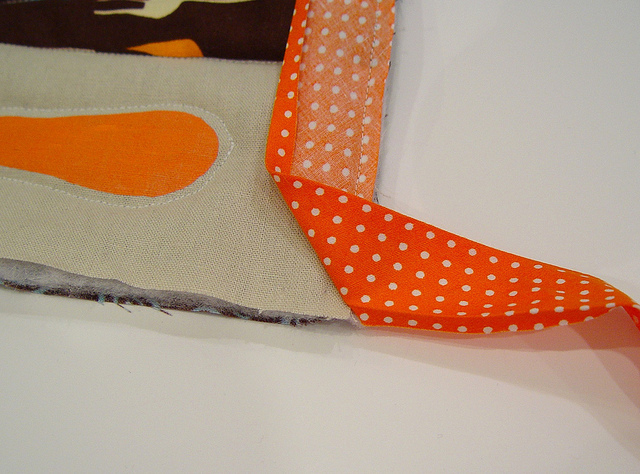 Pin these layers together for quilting. 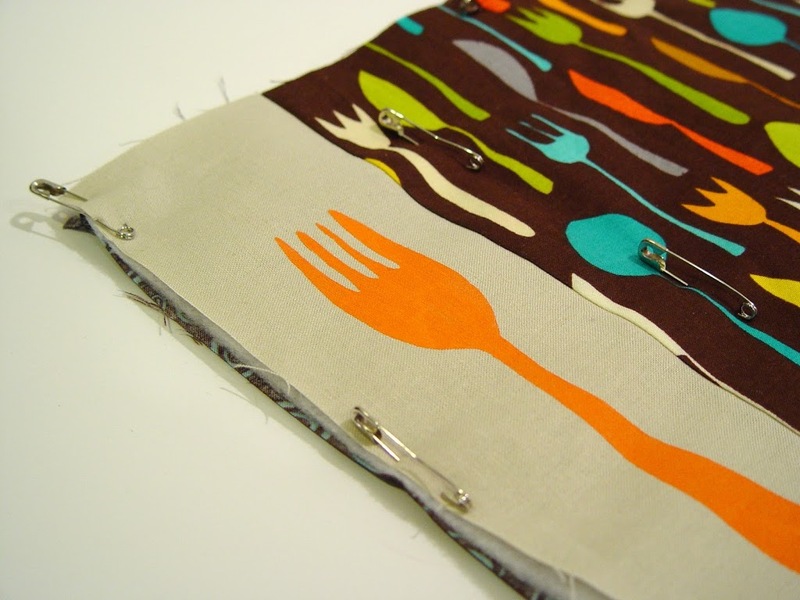 Now slowly sew around your fork close to the paint, roughly a 1/8″ away from the edge. Repeat for the knife and spoon. To quilt the space for the plate. Go to the kitchen and grab a plate or large bowl and trace around it with chalk or a fabric pen. 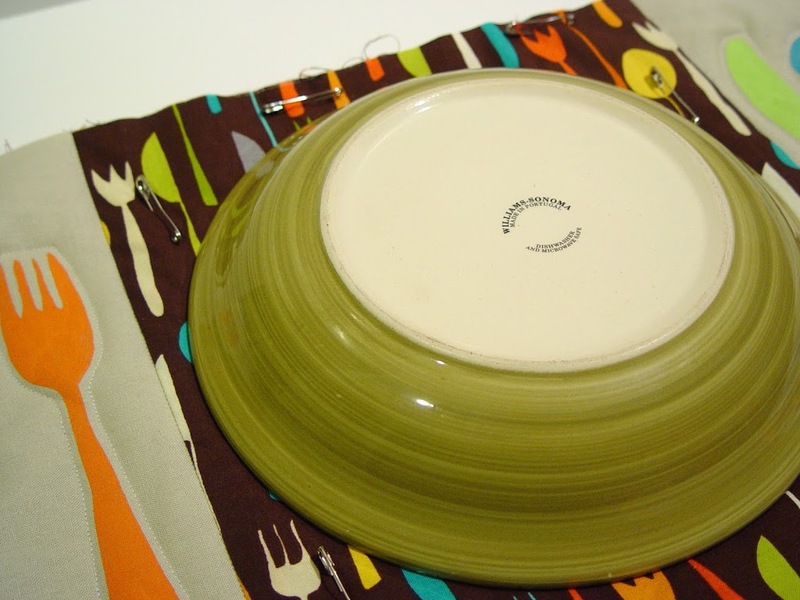 Repeat with a slightly smaller plate or bowl for a smaller inner circle. Sew on these lines and remove any markings from your pen/chalk when you’re done. 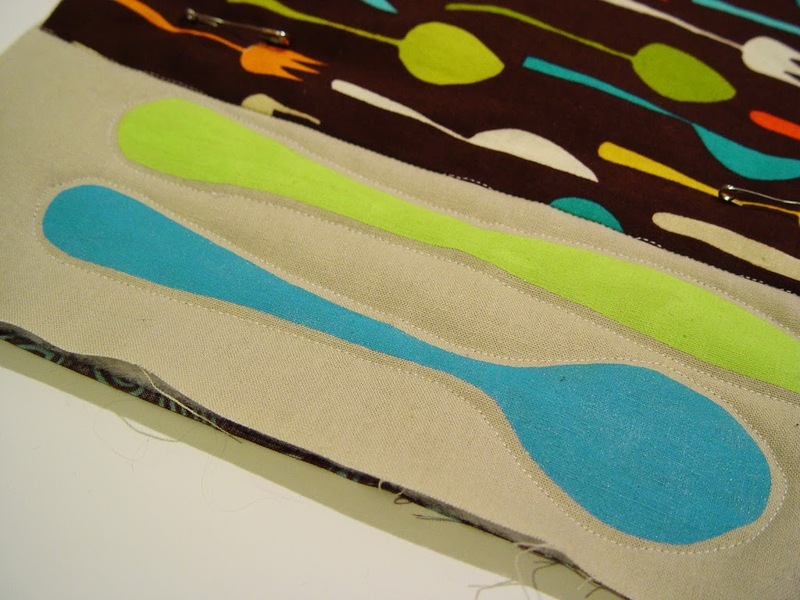 Sew on the binding. 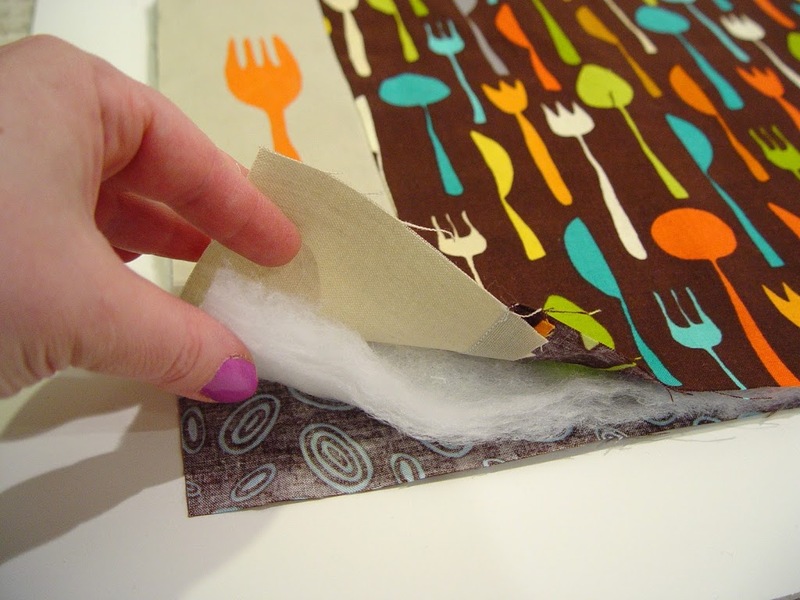 Start by opening the binding and pinning the edge of the binding to the edge of the placemat (right side down), leaving a tail of about 5″. 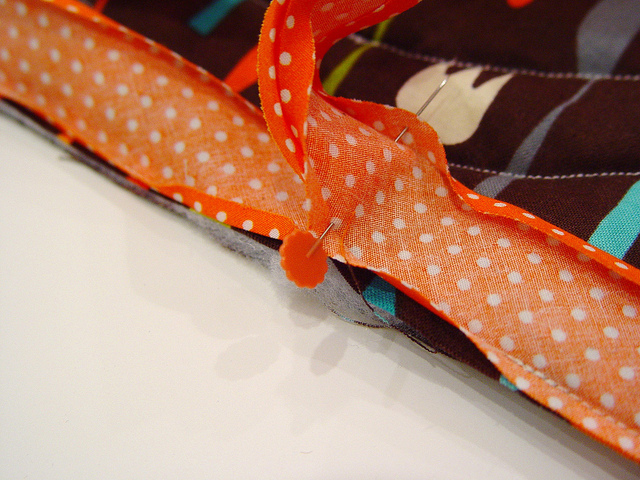 Start sewing down the seam binding, by sewing in the fold line. 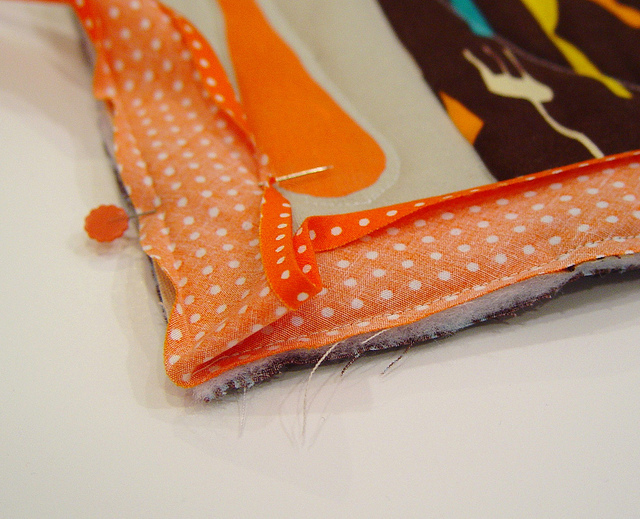 Since I made my seam binding, I chose not to waste extra fabric, so I only have about 1/4″ from the fold to the edge. You may have more. then down (at the edge of the placemat). 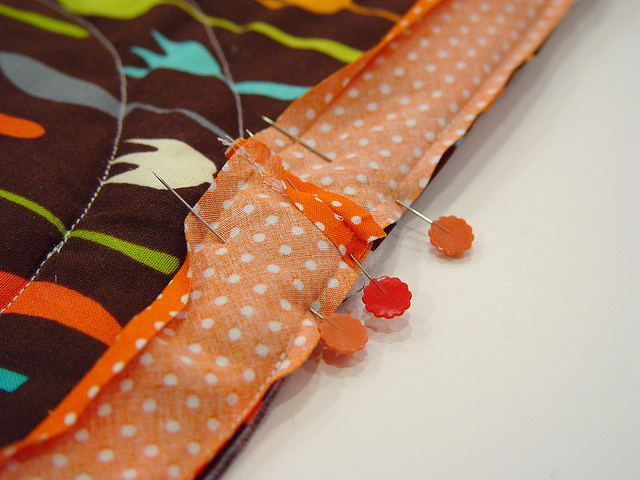 Continue sewing until you’ve gone all the way around stopping a few inches from where you started. 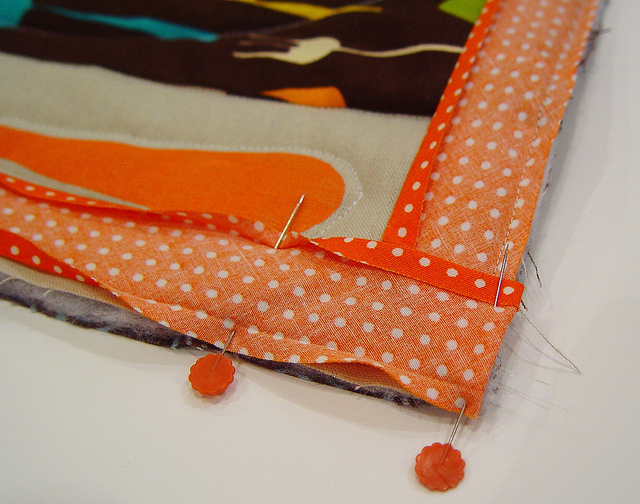 Lay the seam binding out flat and pin where the two pieces come together. 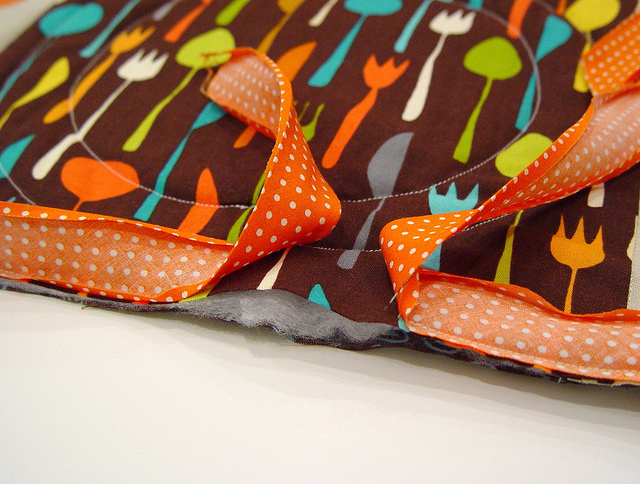 Pull the seam binding away from your placemat and sew them together. Trim the excess. 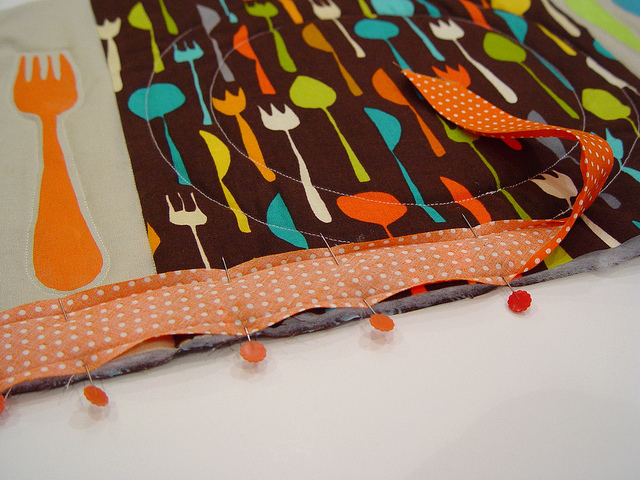 Lay the binding flat onto the placemat and stitch in place. 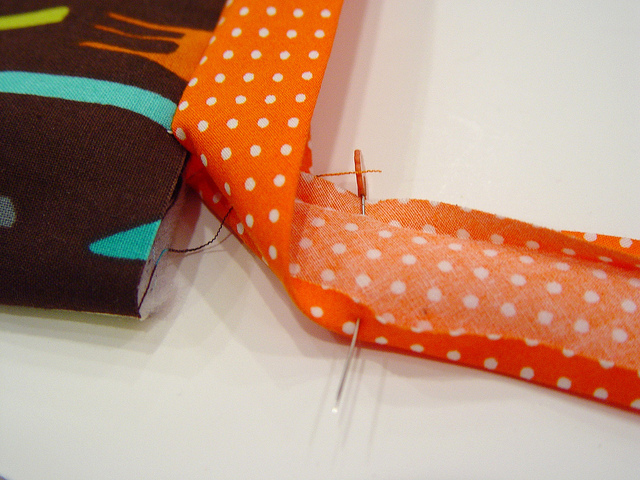 Fold over the seam binding and stitch in place by hand, making sure your thread doesn’t show through to the front side. So go ahead make one or two . . . or six! 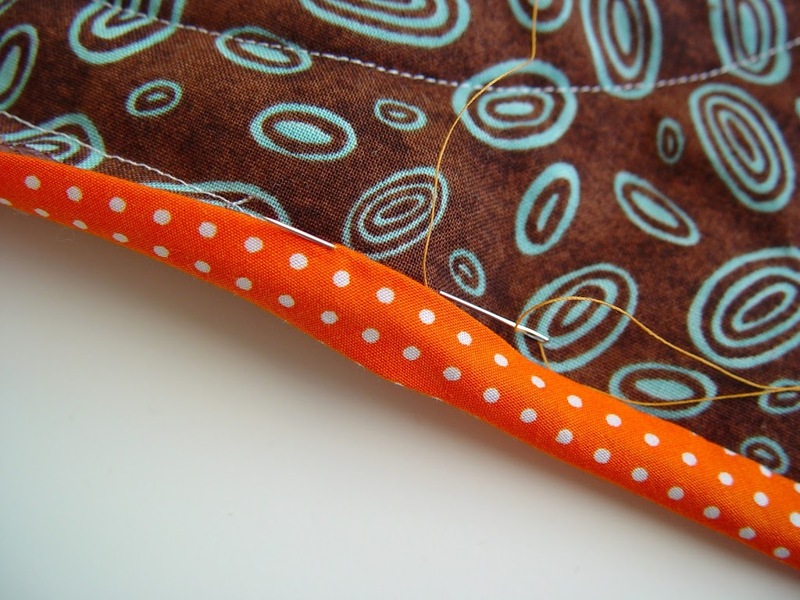 I love the idea and thanks for explaining how to use the seam binding in corners and how to finish it (I’ve been crap at that ;)). I will be making these! This is really cute!! 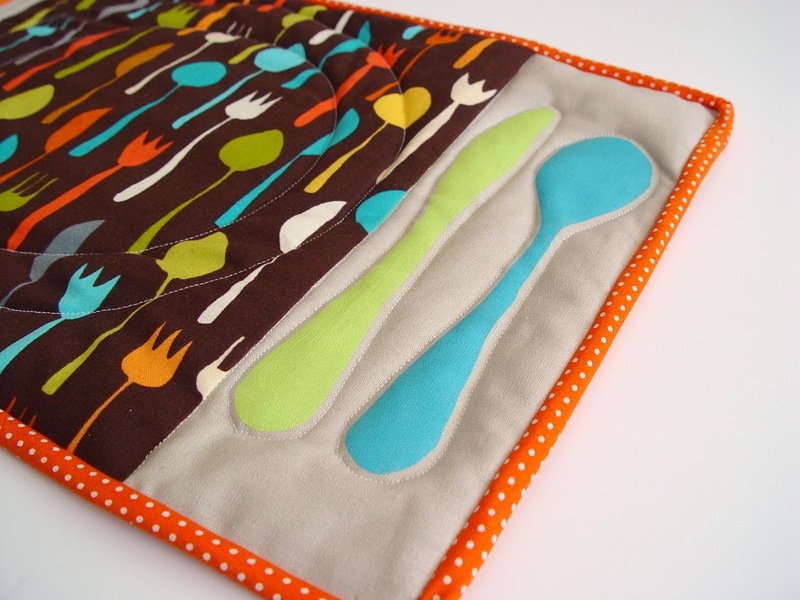 I have been looking to make some place mats for my boys! 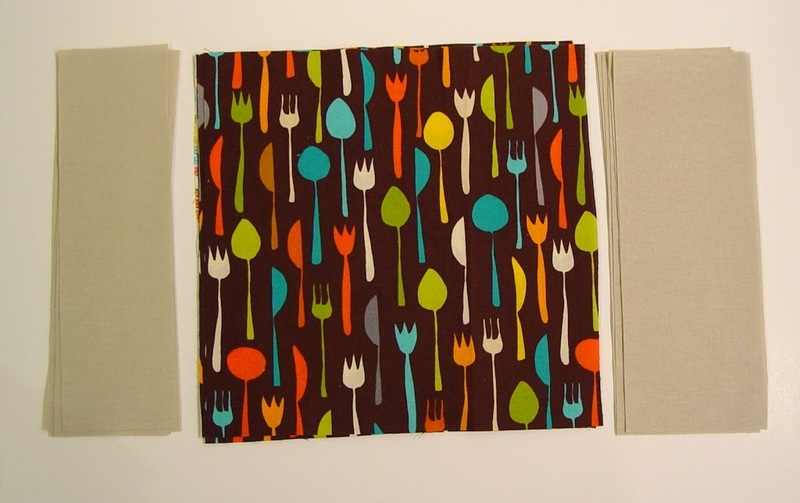 I have that middle fabric and wanted to make placemats out of it but could not come up with a pattern that I loved. This is perfect! 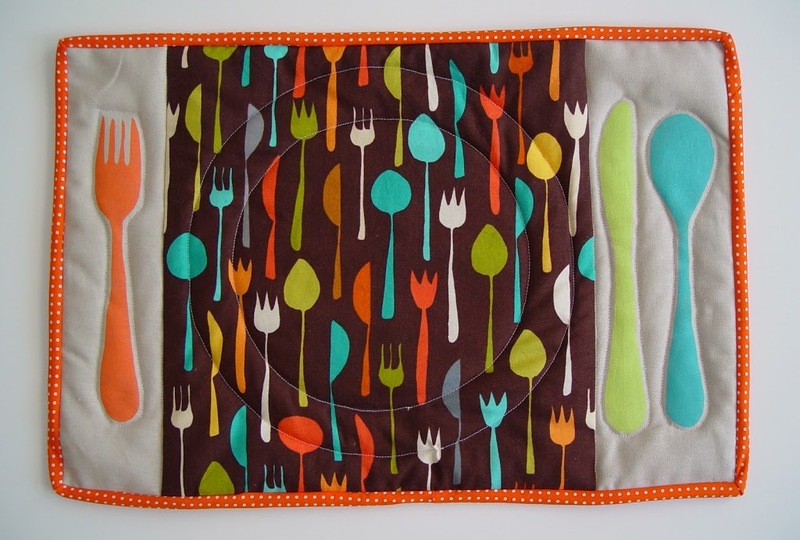 I don’t have any children but overall I think these are super cute placemats – thanks for the tutorial! Love it! 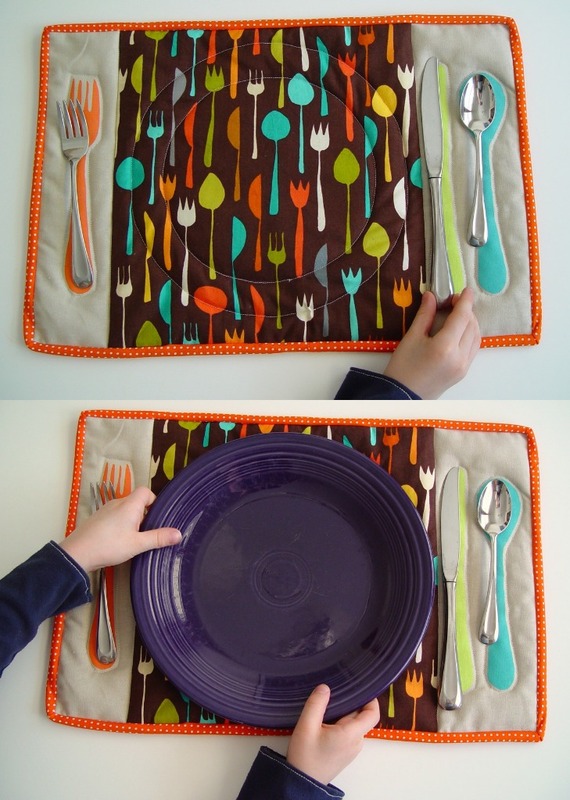 When my daughter sets the table it can be very creative where the cutlery ends up, these could help. Thanks. 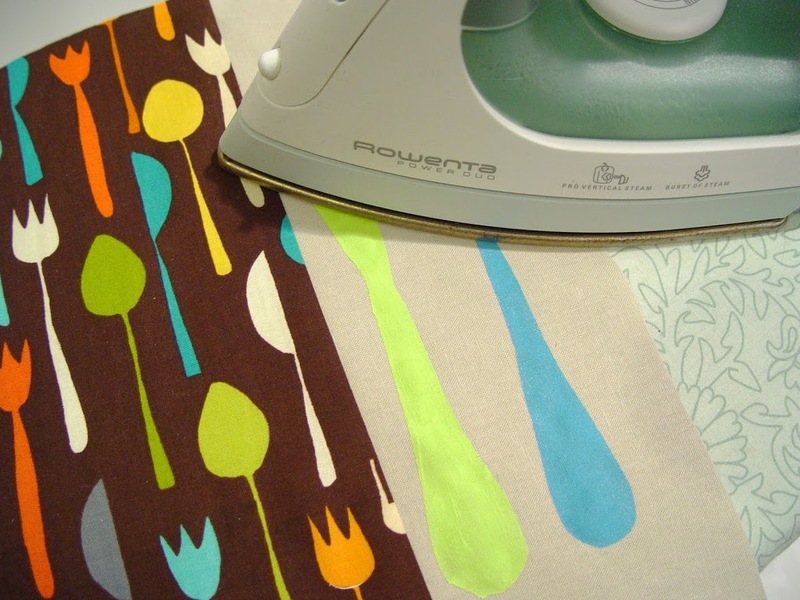 This is such a fantastic idea, and I love the fabric you used. great idea… i love it!! Thank you!! This is so cute and clever. 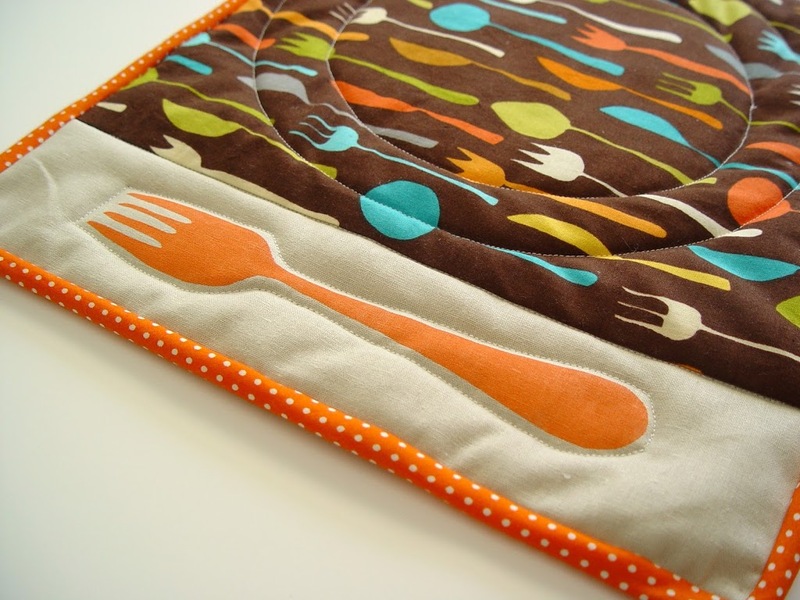 I really love the stenciling and the quilting around the silverware. Thanks so much for sharing. Spray with Scotchguard so it’s even more durable (resistant) to stains from the food. It these were on my table-they would be washed almost daily. This is more than adorable. 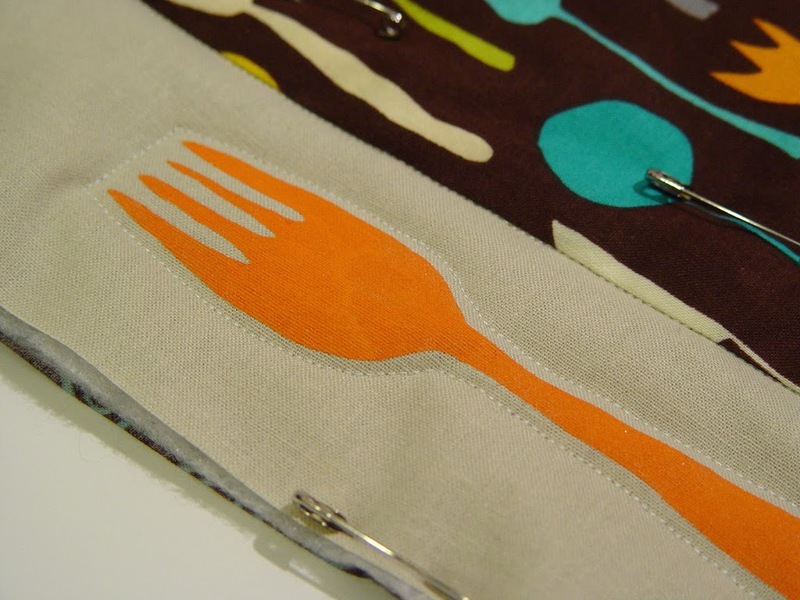 Thanks for telling where you got that fabulous silverware fabric! I love these! I made some out of paper for my classroom once upon a time, but I love the fabric ones so much better! Love it! Been wanting to make some kid placemats for awhile now. This is perfect. And I’m a bit addicted to freezer paper stencils. Thank you! Thanks for the tutorial! 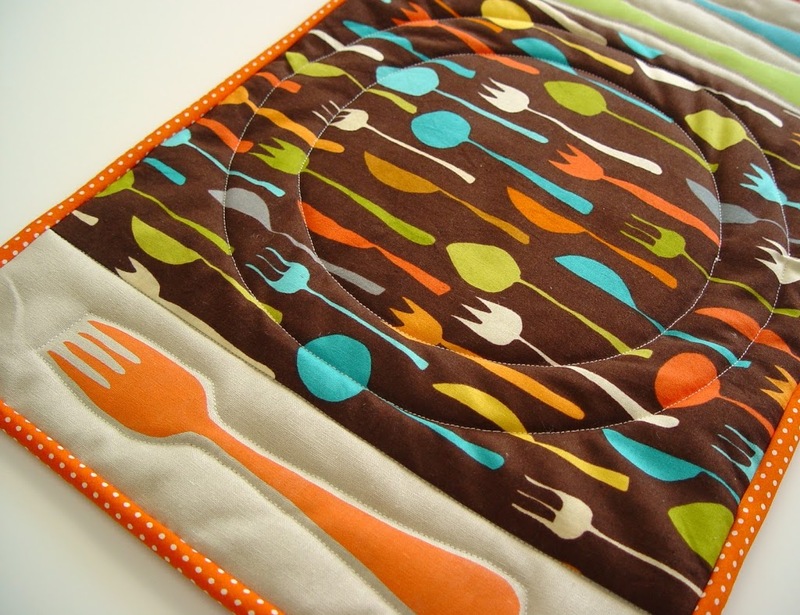 I’ve been looking for a pre-made table setting place mat but we have a round table so the ones I’ve seen don’t fit on our table well but I could make these to fit my table perfectly. Just brilliant! thank you for the tutorial. the placemat is too dang cute. I love this! The fabric is so fun and has colors that I decorate/want to decorate with. Thank you for the fabulous tutorial! I am in LOVE with this placemat. 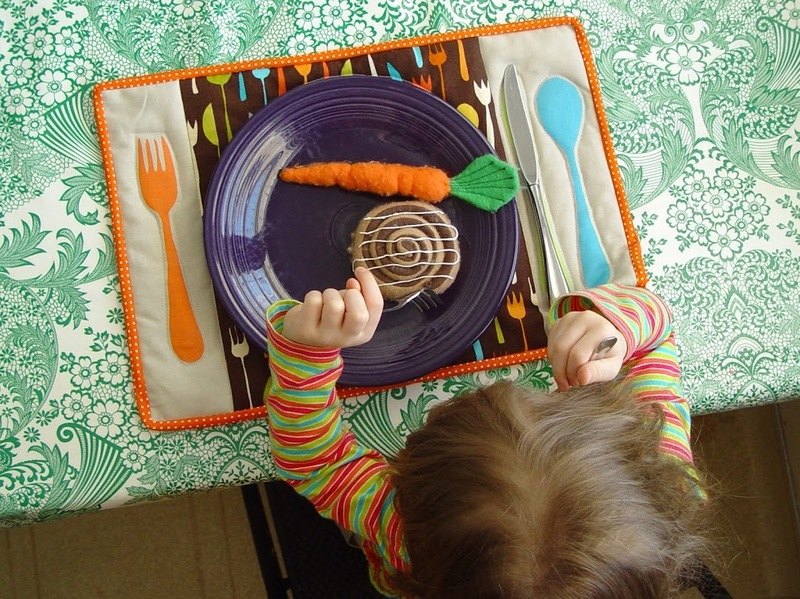 My kid is not old enough to set the table, but I’m gonna make it anyway….so darn cute. Thanks for sharing your pattern and tutorial! Featured you at Today’s Top 20! Hooray! what a fabulous idea!! i love these! i made my own and shared photos on my blog! As a mom of a 6yr. old daughter and twins that are 3 who also love to help… I la,la,LOVE these placematts you made! 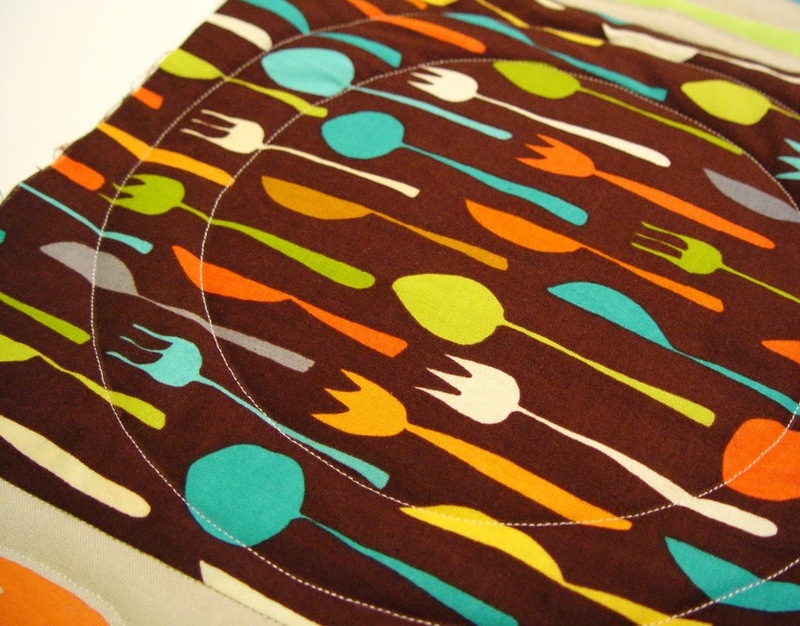 and these placemats will go so much faster using the backing to turn over to the front for these placematts. This has got to be one of the cutest place mats I’ve seen in a long time! 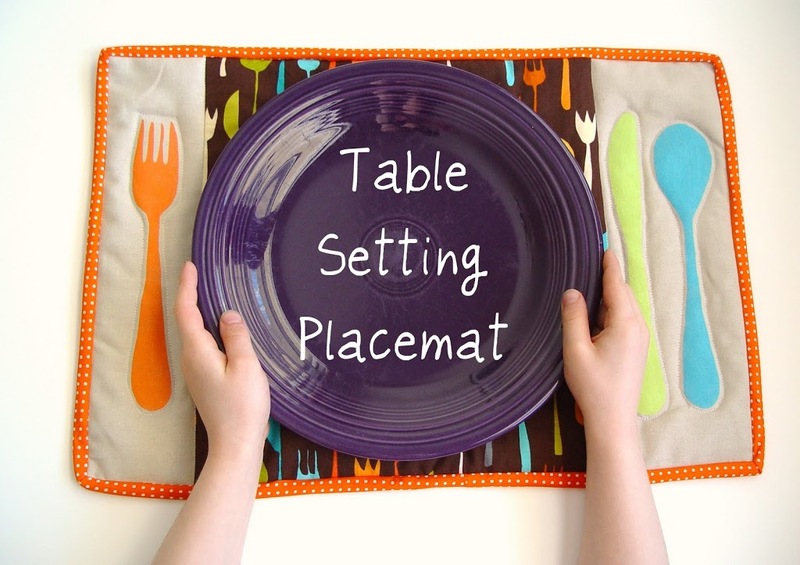 I was writing a post about how table setting placemats can be be used with children with Special Needs when I came across your post. I gave you a shout out, and am hoping that the kids’ grandmother can make us some! This is very cute! I might try it. 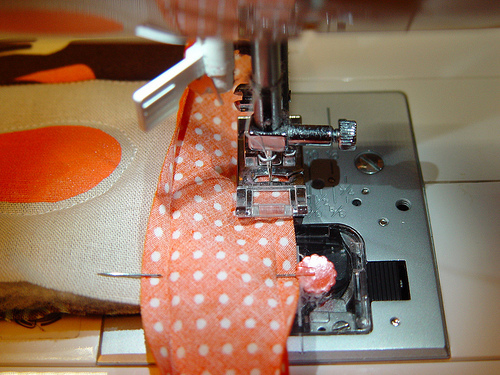 I’ve added it to a permanent linky on my blog for sewing tutorials. 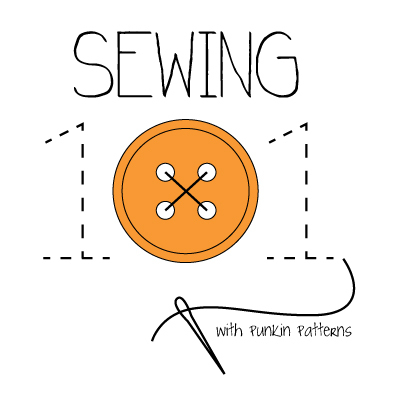 If you have any other sewing tutorials you’d like to link up, feel free~! What a wonderful way to teach the kids! 🙂 Thanks for the generous turorial 🙂 Have a wonderful day! This is so cute! When my son was in elementary school, he was assigned to invent something, and he came up with a similar idea. You executed it very well!